The Youth Theatre Workshop 2015 of the Theatre Company of Saugus presents the junior version of the popular musical Once On This Island. All the cast members are kids ages 6 to 17. They will not only sing, dance, and act, they will also design and build the set, make the costumes, and do everything else you need to put on a show. Come see the results of their work. 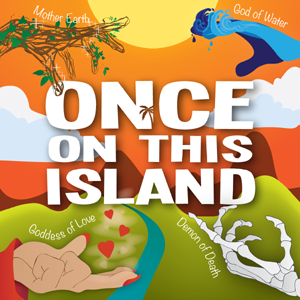 They present Once on This Island Jr. With book and lyrics by Lynn Ahrens and music by Stephen Flaherty. It takes place on a tropical island and is about a girl from the lower classes who loves a boy from the upper classes. Her fate is manipulated by four gods, representing earth, water, love, and death. The performances are on Friday, July 24 at 7 PM, and on Saturday, July 25 at 2 PM and 7 PM. Tickets for the show are $15 for adults, or $12 for seniors, children, or students. All the information about getting tickets is on our Tickets page. The dates of the workshop are July 13-17 and 20-24, 2015. Sessions run from 9 AM until 4 PM Monday through Thursday, and 12 Noon until 4 PM on Fridays. The location of both weeks of the workshop and of the performances will be at Cliftondale Congregational Church (CCC). At 50 Essex Street, in Saugus, Massachusetts. Please note that this is not the usual location for TCS events at ESUMC. See our Directions page. We are thrilled to announce the cast of Once On This Island Jr.
Our teachers leading the workshop are all returnees from last year: Shawn Gelzleichter is the vocal coach for the workshop and the music director of the show. Amanda Allen is the dance instructor and the choreographer and producer of the show. Britt Mitchell is the acting coach and the stage director. Jen Gelzleichter is the technical theater instructor and the stage manager of the show. Tom Holmes is the percussionist. We are grateful to Constellation Energy, an Excelon company, for making a generous donation in support of the workshop.